Ahh, old school cendol in bubble-tea style sealed cup packaging (S$1.80, with ice). 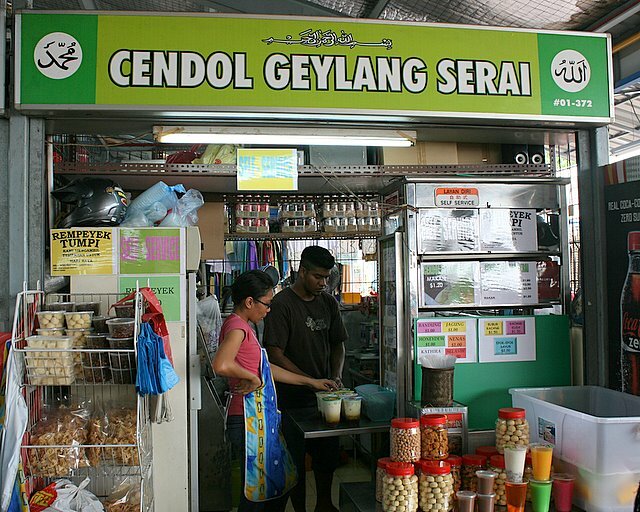 This stall offers chendol that's just coconut milk, gula melaka and cendol - and very importantly, the slim, light green cendol, not the fat, garish green strips of flour. This is cendol the way it used to be. None of the Chinese additions of red bean, cubed jellies and whatnot. 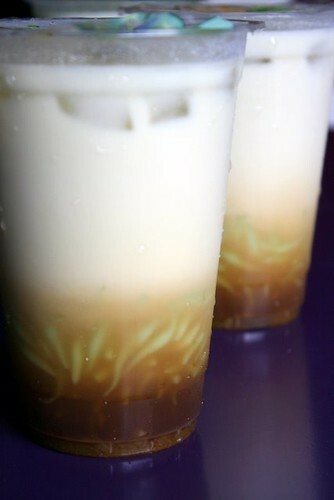 Would this be similar to the cendol that I remember from the past? Hmmm, well, still not quite but close. While it's pretty good, this one is extremely rich, sweet and thick. The one I long for is thinner and more refreshing. Well, I guess you can add more ice or cold water to approximate the taste. Sedapnye boleh juga lerr. Pekat santannya, senang jelak. Cairkan sikit lagi bagus. One of my favourite drink. Sweet and nice.